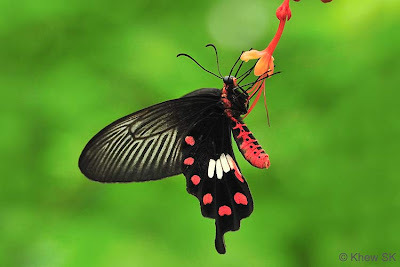 In an earlier article on Butterfly Predators, we saw how a butterfly's life is fraught with danger all around them, particularly from carnivorous predators. These range from birds and lizards, to spiders and dragonflies. In 1866, Alfred Russel Wallace, in response to Charles Darwin, was the first to suggest that conspicuous colour schemes of some insects may have evolved through natural selection as a warning to predators. Following that meeting of the Entomological Society of London, John Jenner Weir conducted experiments with caterpillars and birds in his aviary for two years. The results he reported subsequently in 1869 provided the first experimental evidence for warning colouration in animals. Aposematism is a secondary defence mechanism that warns potential predators of the existence of another primary defensive mechanism. 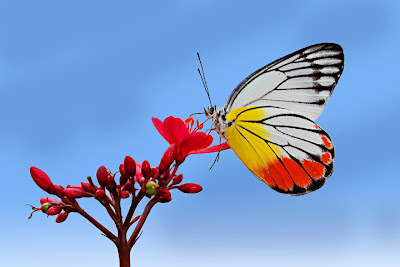 In the butterfly world, the primary means of defence is usually because of the unpalatability of the butterfly. The species that exhibit this primary defensive trait are usually those whose caterpillars have evolved mechanisms to sequester plant toxins and use them for their own defense. 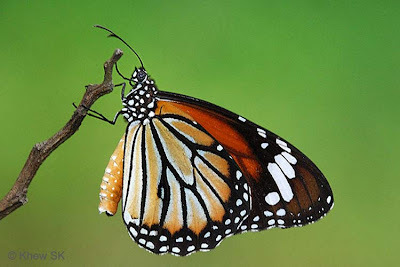 The butterfly species that have been able to synthesize these toxins at their caterpillar stages will present themselves as an unattractive prey to predators like birds and lizards, which may suffer diarrhoea or nausea after eating the butterfly. 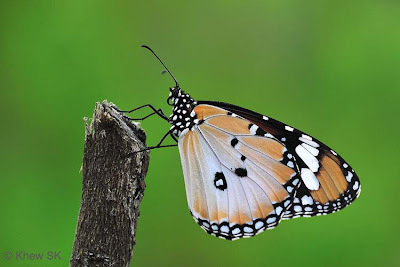 Predators will quickly learn to avoid these species of butterflies, and very often, these are the species that exhibit warning colouration or possess easily recognisable and distinctive patterns on their wings. 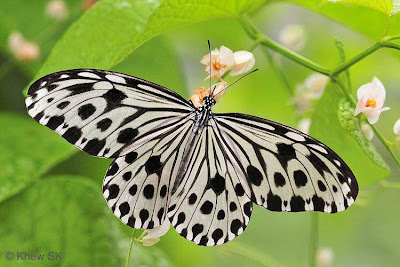 Once a predator 'learns' from experience that these conspicuous butterflies are distasteful, they will henceforth continue to avoid any similar looking (patterned or coloured) butterfles in future. 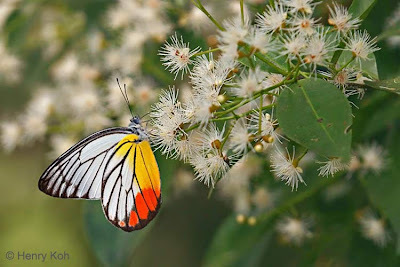 Amongst butterflies, the typical warning colours are black, yellow, red and orange. However there are others that are greys or whites, and not necessarily brightly coloured, but with patterns that are distinctive and prominent such that they become easily recognisable. These species tend to call attention to themselves, and are those that we human beings are also able to spot easily due to their "advertising" their presence in the field. 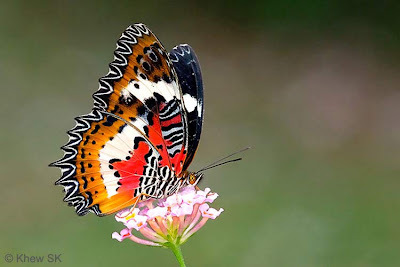 It is the colours, the combination of colours and the patterns that these butterfly species evolve, that make them recognisable to their predators. Aposematic colouration as a function of clarity - increased chromatic contrast, luminance contrast, and sharpness make a pattern easier to recognise. 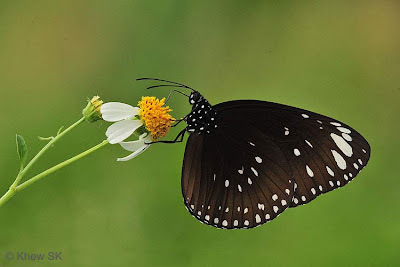 Amongst the butterfly families, the species that display aposematic colouration are usually from the Papilionidae (typically feeders of Aristolochia spp), Pieridae (from the genus Delias), sub-family Danainae (almost all the species that feed on lactiferous vines such as Asclepias) and sub-family Heliconiinae (whose caterpillars feed on Passifloraceae). However, it would be untrue to say that all brightly colourful butterflies are unpalatable. Other than those which mimic the unpalatable model, which will be the subject of a forthcoming blog article, there are other species that are as equally colourful and bright, but without possessing any primary defense characteristics and are hence fair prey for a predator. 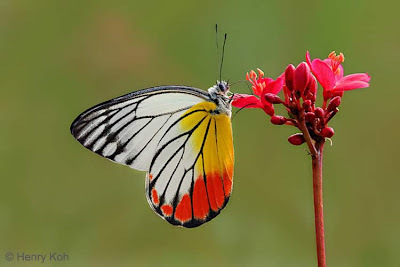 So the next time you see a colourful and recognisable butterfly fluttering amongst the flowers in your garden, consider the fact that it may be intentionally attracting attention to itself as an advertisement of its unprofitability as a prey item to potential predators. To us humans however, we look in awe and admiration at its beauty and colours as one of Mother Nature's Flying Jewels.